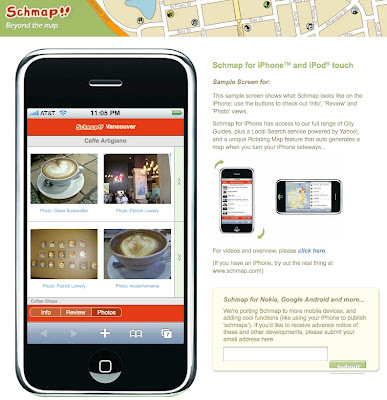 I got an email this morning from the folks at Schmap to let me know their guides are now available for iPhone and iPod touch and my photos are included. I played around a lot with the online version and I'm totally in love with it. Schmap and iPhone - perfect synergy. I'm glad I could play with it online because that's the nearest I'll get to actually possessing my own iPhone. After all what is the point of having a state of the art, intuitive, beautifully designed, expensive phone if you live in a VILLAGE WITH NO CELLPHONE SERVICE?